His Holiness Sri Sai Baba Of Shirdi has millions of devotees in all the religions and in almost all the parts of the world today..The holy place of Shirdi where Sri Sai Baba had spent most of His saintly life,in a small old Masjid,is the most revered place for many of these devotees who take any pain in their life to go there often..
During His lifetime and also after His ‘Samadhi’,Sri Sai Baba had performed and is still performing many mind blowing miracles much to the surprise of atheists and also to non atheists..Most often Sri Sai Baba had performed these miracles to save His ardent devotees in their tough times and less often to prove His nobility to the world.. Although each and every one of His miracles baffles our mind,here’s the first known or first recorded miracle of Sri Sai Baba’s life that He performed in 1892 during His historic stay in that Mosque in Shirdi..
Ganapat Dattatreya Sahasrabuddhe,who is more popularly known as Das Gunu to all the devotees of Sri Sai Baba,came to see Sai Baba for the first time in 1892..Das Gunu,in course of time,went on to become one of the greatest devotees of Sri Sai Baba and was always there with Him during all the major and important events of this glorious Saint’s life.. It was also on an evening in the presence of Das Gunu that Sri Sai Baba had performed the first miracle of His lifetime at the holy Masjid..This is exactly what has happened in the Masjid that evening.. The local vendors of Shirdi,those days,who would voluntarily offer lamp oil to Sri Sai Baba to light the lamps in the Masjid during the nights have suddenly decided not to offer anymore oil to Baba that evening..They all felt they are wasting their money on some one who is just an ordinary human being like them..
Because of their sudden and innocent decision,the oil lamps in the holy Shirdi Masjid could not be lighted that night…That really disappointed every devotee present in the Masjid that evening..However they all just kept quiet without informing about it to Sri Sai Baba.. “..Baba..The local merchants who are donating oil to us everyday have refused to donate it any more..”..
No one uttered a word for a moment as everyone just stood silent..
After a lot of hesitation,one of the devotees replied.. It was exactly at that moment..Before anyone could realize what was happening..And before anyone could even move..
And lighted them in a flash again with all the divine powers He’s endowed with..
All the devotees including Das Gunu,who were there in the holy Masjid that time were shocked into stunned silence.. They just couldn’t believe what they have witnessed..Weeping loudly,the devotee who informed Sri Baba about the reaction of the local merchants rushed to Baba; fell on His feet; and wept inconsolably until Baba lifted him and blessed him with a peace filled tears less life forever.. 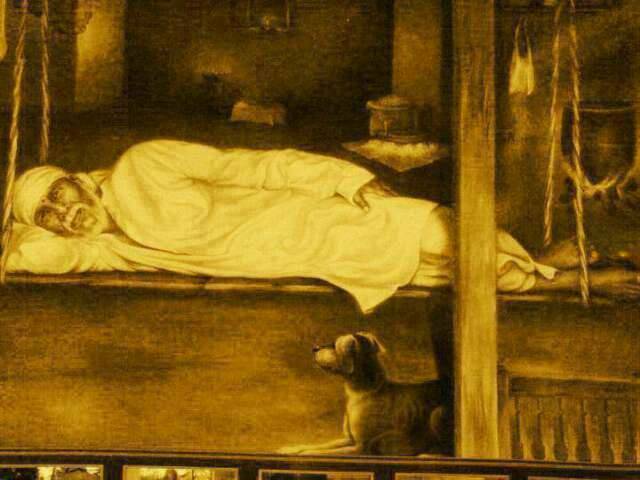 This miracle later became the first known or recorded miracle of Sri Sai Baba that He performed during His stay on this Earth.. With this unbelievably amazing miracle Sri Sai Baba had not only driven away all the darkness from the holy Shirdi Masjid but had also driven it away from the minds of all those skeptics living in and around Shirdi village those days..